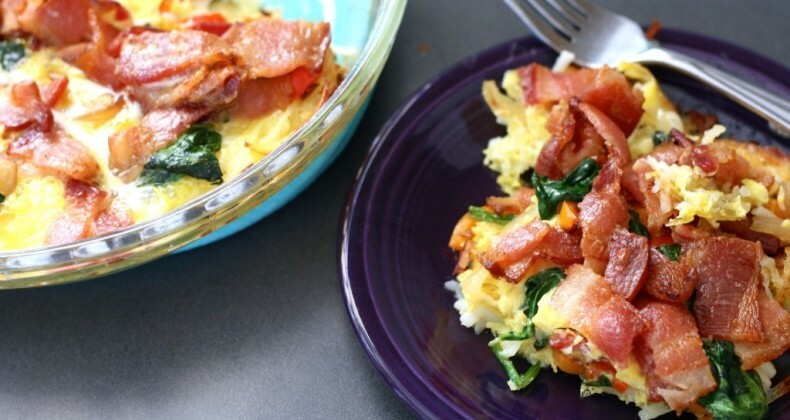 Crisped hash browns form the crust in this wonderful gluten-free quiche. Scroll down for the recipe if you don’t want to read my thoughts on my Whole30 journey. My journey with Whole30 began just over two weeks ago. Which in reality isn’t that long but somehow it feels like a lifetime ago. To summarize Whole30 is a commitment to go 30 days without eating dairy, grains and gluten, legumes, and sugar. Why would anyone want to do that you might be wondering? The idea is by stripping out those foods you will be able to let your body heal and recover from any ill side effects those foods may have been causing. Without going into great detail I will say I have been suffering from horrible burning stomach pain for the last 8 months and truly off and on for the last six years. Last fall I decided I would finally see a doctor about this so I had an ultrasound of my gallbladder, endoscopy, celiac test, and a gastric emptying study. All the tests came back within the “normal range” but barely. I was left feeling frustrated and without answers. After seeing stuff online about Whole30 I finally decided to take the plunge when one of my friends was starting too. Doing it with support was nice. My goal was to “reset” my gut. Flood it with whole clean foods in hopes of feeling better. Â Another reason was to control the “sugar dragon”. I read testimonials about it being life-changing, soaring energy levels, and weight loss. All these things sounded nice. I was lucky enough to not experience a sugar hangover. After just a few days of eliminating the noncompliant items, I felt less puffy and bloated. My skin was clearer. Each day I woke up ready to hit the ground running but by the end of the day, I was depleted of energy. Unfortunately, I didn’t experience the soaring energy levels others spoke of. Maybe they come towards the end of the 30 days. Or maybe it has something to do with at least one of my four children waking me up several times in the middle of the night (wants to nurse, has stomach pains, is wheezing, or growing pains all reasons I have been woken up recently). These last 14 days have been really hard but have taught me a lot. It saddens me to say it but I have to pause my Whole30 journey. The reason being I just can’t keep my milk supply up and Felix has become even needier (teething, I think). While my health and wellbeing are important to me my children come first. I look forward to revisiting this once Felix is weaned. So moving forward… I am looking into having a food allergy panel done. I had a weird reaction to corn tortilla chips at the end of my portion of Whole30. As far as what I will eat? Gluten, corn, and sugars are going to be consumed in extreme moderation. Also, I am really going to make a conscious effort to eat the rainbow in the forms of more colorful fruits and vegetables more frequently at all meals. This will only get easier as Spring approaches. Have you ever done a Whole30 or portion of one? How did it go? Please leave a comment or email me if have any questions about my experience or want to know more. On Whole30 you can eat the daylights out of eggs. Which at first sounds awesome. Eggs + Bacon?! Yes, please! Believe it or not, it QUICKLY got old. 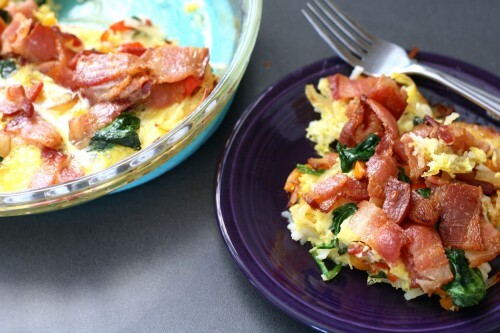 I needed a way to jazz up my breakfasts/brunches/lunches that were still gluten/grain free. Potatoes to the rescue! 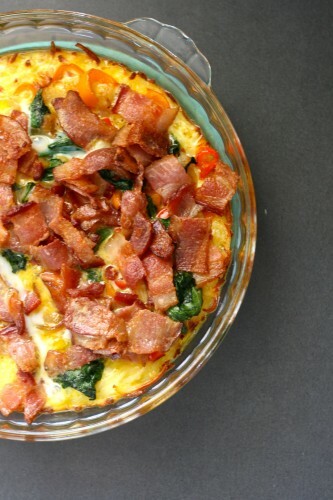 If you’ve been a long time reader you are probably tired of me expressing my love for breakfast quiches and casseroles. So I will spare you my going on and on. Just know this quiche is great. Like super great. I liked it even more than the pie crust version (gasp!). 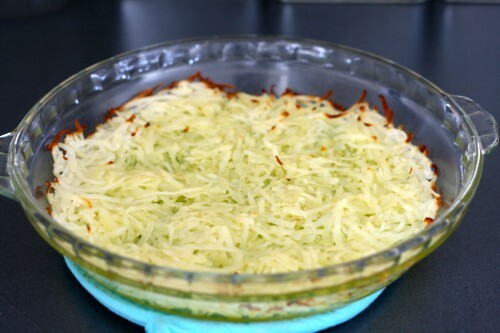 Hash browns are pressed into a pie plate, drizzled in oil or butter/ghee, and baked until they start to crisp up about 20 minutes. 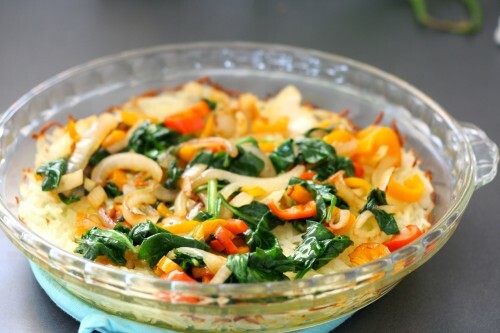 Meanwhile, fry up bacon or sausage and sauteed veggies to put in the quiche once the hash browns are done cooking. Pour in the eggs and bake for another 20 and you will be good to go. Have you tried a Whole30 before? I did do the Whole30 this year just to try it out since I recommend it constantly. I ended up GAINING weight. My diet plan was better before I started. Haha. I look forward to giving it a go once I am done nursing. After only a few days of being off the strictness of it I am already being more strict with what I eat. I can’t believe you lost 65 pounds! !